From last time update, we have completed the Aigang.Data Insurance Risk Model Upload functionality and social features (comments). The integration with MetaMask is also completed and it will be a link for user experience between Aigang.Platform and their personal wallets (eg. staking AIX). For those who don’t have AIX tokens on their wallet, we are building a convienent tool in Platform to buy/sell/trade AIX tokens from open market (and in future with fiat), to be able to use Aigang platform with AIX tokens. It covers news and updates to Production (eg. new releases for Platform or protocol), QA ready for testing and tasks for next sprint. We hope it will give more light to our work and approach towards building Aigang and involve more people to contribute. We also have made a decision to create a testing group for development and releases. Everyone who can and want to help us with feedback, testing and fixing bugs will be able to join internal bug bounty and testing group and can share a reward pool for their work. Will be announcing as separate post soon. 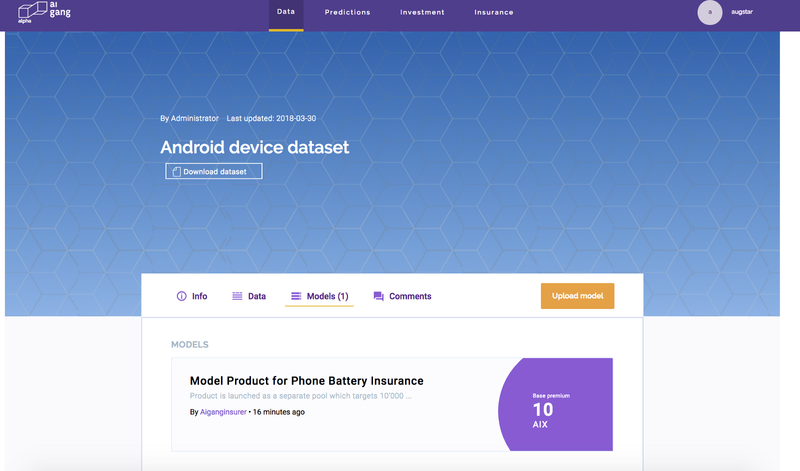 Based on the data we collected from our PoC apps for phone battery insurance, we have created first Insurance risk model and it is uploaded to Aigang Platform. Our first risk model is based on AIX tokens, meaning paying for insurance, payouts for claims and insurance capital pool will be based on AIX tokens. It is likely that for this first smart contract insurance we will make full insurance pool from Aigang wallet, and in future we will be adding a community based insurance risk pooling (example of investment in insurance can be found from our earlier PoC — https://investment.aigang.network/insurer.html). As mentioned before, we are working for our Aigang.Predictions platform part and first decision we took was to use our Insurance Risk model and product for phone battery as test case scenario. What will be the profit ratio of the pool? How much premium will be written? What will be the loss ratio of the pool? What will be the claim frequency? We are working on Prediction market architecture & PoC, and will be announcing its release as we get closer to implementation. In general, it hasn’t been easy times for crypto and us too, but we are really happy to show that we are coming up with more and more actual results and implementations (and not hyping about something that is only on paper). We are moving with good speed to full working Platform, Protocol and AIX token use cases. With that, we see more confidence in going out to market with more advertising and marketing actions for Aigang Platform and later, for Aigang Insurance Protocol. We appreciate your support, patience and dedication to the Aigang. There will be more and more ways to participate or contribute by using Aigang Platform after Prediction markets light release. Finally, big shout out for Yoann D. for your ideas, comments and help with github— merci!